For the civilian joint-use airport, see Palmdale Regional Airport. United States Air Force Plant 42 (Plant 42) (IATA: PMD, ICAO: KPMD, FAA LID: PMD) is a classified United States Government aircraft manufacturing plant, used by the United States Air Force. It is also used by the National Aeronautics and Space Administration (NASA). Plant 42 is a United States Air Force facility. 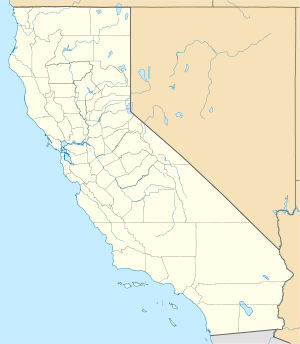 It is the Antelope Valley's second-largest employer, and is owned by Wright-Patterson AFB but operated as a component of Edwards Air Force Base, 23 miles northeast of the airport. Most of the facilities are operated by private contractors and serve as a manufacturing plant for aircraft used by the United States and their allies' militaries. Plant 42 has 3.2 million square feet of industrial space and a replacement value of $1.1 billion. Some of the plant's work involves production of spare parts for military aircraft, with other projects including maintenance and modification of aircraft such as the B-2 Spirit bomber and production of the Global Hawk and other unmanned craft. 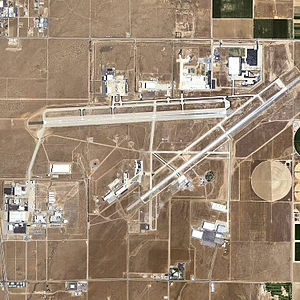 Aerospace contractors at Air Force Plant 42 share a common runway complex, and either lease building space from the Air Force (an arrangement commonly referred to as a "GOCO," or Government Owned Contractor Operated) or own their own buildings outright (e.g., Lockheed Martin Skunk Works). There are eight production sites specially suited for advanced technology and/or "black" programs. Currently, the most well-known contractors at Plant 42 are Boeing, Lockheed Martin (home of the legendary Skunk Works), and Northrop Grumman. Previously, the facilities were operated by IT&T; McDonnell-Douglas Aircraft Co.; Lockheed California Co.; Norair, a Division of Northrop Corp.; and Lockheed Air Terminal. Plant 42 remains a GOCO, but also now includes AF operations. Contractually operated for the Air Force since 1954, the Air Force under the Obama administration chose to in-source the contracted operations of the plant. The airfield is now operated by DoD, with 412 TW/Operating Location, Air Force Test Center in command. Plant 42 controls over 5,800 acres (23 km²) of Mojave Desert land north of Avenue P and south of Columbia Way (Avenue M). The western border is Sierra Highway, and the plant extends east to around 40th Street East, south of Avenue N to Avenue P, and 50th Street East north of Avenue N to Columbia Way (Avenue M). Sign by one of the gates into Plant 42. Northrop Grumman's B-2 final assembly and modification facility is at Palmdale. The Department of Defense, in February 1995, announced its plan for providing depot support for the B-2. The plan includes a mix of commercial and organic sources for providing various functions and/or maintaining various components. For example, the engines are to be maintained by the Air Force, software support is to be provided by commercial sources, and airframe maintenance is to be provided by Northrop Grumman at Palmdale, California. Rockwell's Palmdale assembly facility is where all the individual parts, pieces and systems of the Space Shuttle came together and were assembled and tested. Upon completion, the spacecraft was turned over to NASA for transport overland from Palmdale to Edwards Air Force Base, California. NASA's Dryden Flight Research Facility at Edwards Air Force Base was the site of the mate-demate facility for mating or demating the spacecraft and the shuttle carrier aircraft. Approximately 250 major subcontractors supplied various systems and components to Rockwell's Palmdale assembly facility. The structures of the orbiter were manufactured at various companies under contract to Rockwell International's Space Transportation Systems Division, Downey, California. The upper and lower forward fuselage, crew compartment, forward reaction control system and aft fuselage were manufactured at Rockwell's Space Transportation Systems Division facility in Downey and were transported overland from Downey to Rockwell's Palmdale, California, assembly facility. The midfuselage was manufactured by General Dynamics, San Diego, California, and transported overland to Rockwell's Palmdale assembly facility. The wings (including elevons) were manufactured by Grumman, Bethpage, Long Island, New York, and transported by ship from New York via the Panama Canal to Long Beach, California, and then transported overland to Rockwell's Palmdale assembly facility. The vertical tail (including rudder/speed brake) were manufactured by Fairchild Republic, Farmingdale, Long Island, New York, and transported overland to Rockwell's Palmdale assembly facility. The payload bay doors were manufactured at Rockwell International's Tulsa, Oklahoma, facility and transported overland to Rockwell's Palmdale assembly facility. The body flap was manufactured at Rockwell International's Columbus, Ohio, facility and transported overland to Rockwell's Palmdale assembly facility. The aft orbital maneuvering system/reaction control system pods were manufactured by McDonnell Douglas, St. Louis, Missouri, and transported by aircraft to Rockwell's Palmdale assembly facility. They were also transported by aircraft from Rockwell's Palmdale assembly facility to the Kennedy Space Center. The National Aeronautics and Space Administration had been paying the Air Force for use of Plant 42 facilities for the shuttle work. NASA decided in February 2002 to shift space shuttle overhaul and modification work from Palmdale to Florida. The Blackbird Airpark Museum part of Air Force Flight Test Museum and the adjacent Joe Davies Heritage Airpark (formerly Palmdale Plant 42 Heritage Airpark) have recently been opened on Plant 42 property along Avenue P (both are free to the public) with displays of the SR-71, U-2, Century Series fighters and other aircraft designed, engineered, manufactured, and flight tested at its facilities. 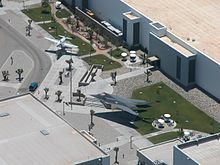 The Blackbird Airpark Museum is an extension of the AFFT Museum at Edwards AFB, while the Heritage Airpark is operated by the City of Palmdale. The origins of Plant 42 go to the early 1930s, when a small airstrip was built in the desert. It was listed in 1935 documentation as CAA Intermediate #5. It was established by the Bureau of Air Commerce (later the Civil Aeronautics Administration) who maintained a network of emergency landing fields. It provided a pilot in distress with a better alternative than landing on a public road or a farmer's field. In 1940, Palmdale Army Airfield was activated as a United States Army Air Corps (later Air Forces) airfield for use as an emergency landing strip and for B-25 Mitchell medium bomber support training during World War II. It was one of many intermediate fields that were used as auxiliary fields or emergency landing fields by the AAF during World War II. Their dispersion along the air routes, their infrequent use, and their U.S. government ownership made them ideal for use by military aircraft. It acted as a sub-base for Muroc Army Airfield and Hammer Army Airfield. 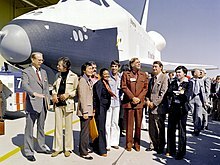 The Space Shuttle Enterprise rolls out of the Palmdale manufacturing facilities with Star Trek television cast and crew members in September 1976. Palmdale Army Airfield was declared a surplus facility in 1946 and was purchased by Los Angeles County for use as a municipal airport. The outbreak of the Korean War in 1950 caused the Air Force to reactivate the property for use in final assembly and flight testing of military jet aircraft. Both the Air Force and its aircraft contractors needed a location away from major population centers - due to sonic booms, other noises and security concerns - but close enough to the major centers of aircraft design and production, while having excellent flying weather the year around. The land which became Plant 42 fit these criteria. Consequently, the Air Force agreed to purchase the land from Los Angeles County in 1951. The Air Force awarded a contract to Lockheed Aircraft to develop the master plan for the site. The plan was to construct a facility that would meet the requirements of full war mobilization and augment the industrial production potential of the major airframe manufacturing industry in southern California. The concept for Air Force Plant 42 originated in the challenge of flight testing high performance jet aircraft over heavily populated areas. 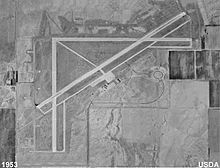 Following approval of the Master Plan in 1953, the Palmdale Airport officially became Air Force Plant 42; ownership of the installation was transferred to the Federal Government in 1954. With USAF encouragement, Lockheed, looked upon with favor by the Air Force at this time, established its permanent presence at Plant 42. It signed a lease in 1956 for 237 acres to use Palmdale Airport for final assembly and flight testing. Lockheed's famed "Skunk Works" (a location for black projects), which developed such aircraft as the U-2, SR-71 Blackbird and F-117 Nighthawk, is at Site 10 of the complex (actually private property with secure access to Plant 42's airfield), near Sierra Highway. It relocated to Plant 42 from its original Burbank-Glendale-Pasadena Airport (now Bob Hope Airport) site in Burbank after the end of the Cold War. Its present hangar was constructed in 1968 and the outer walls of the structure were put up in a matter of days. Its hangar originally was built for the Lockheed L-1011 Tristar passenger jet project. ^ Palmdale Contractor Operated Installation. // Department of Defense appropriations for 1970, pt. 2, pp. 816-817. ^ a b "California World War II airfield database". Archived from the original on 2016-09-27. Retrieved 2016-04-14. Wikimedia Commons has media related to Air Force Plant 42.